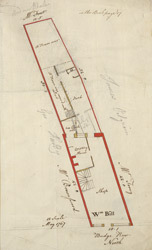 This is a plan from a rent book that belonged to the Mercers' Company, one of the most prominent of the City Livery Companies. The Mercers' were merchants who dealt primarily in textiles. Amassing great wealth they came to own property in the City which they leased to tenants. This is a property on Budge Row. The names of the owners/tenents of the building and those surrounding it are noted. Budge Row takes its name from the budge or lamb skin dealers who once lived here.